Plains, GA--John Williams gathered up George Royal, Carol Royal, Jeanne Starr (f/k/a Hewetson), Elmo McAlister, Art Shelfer, and Janice Shelfer, loaded them into his Suburban, put two canoes on top, two on the trailer, and heaed off for the annual midwestern canoe voyage. 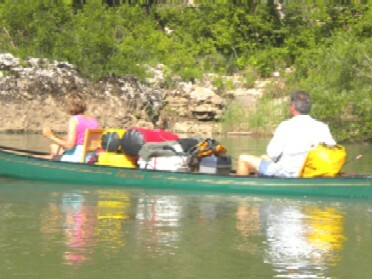 Plans were to canoe the Buffalo River in Arkansas. The group left Plains on Friday afternoon, June 12, and headed west being at the Green Top Barbecue in Birmingham. They complained that it was somewhat short of the culinary delights prepared by Elmo and John. They drove through thunderstorms all the way to Tupel, Mississippi where they spent the night. After stopping in C onway, Arkanasas, for ice, last minute items, and fishing licenses, the group procceeded to the outfitter. The seven arrived at the outfitter about 3:30 PM and were on the Buffalo about an hour later. The water was muddy brown due to the heavy rains, and it was running fast. The temperature reached a sweltering ninety-eight. The hot weather was dubbed “fire stick.” Fishing began once the camp was set up. The group was blessed with an horrific thunderstorm which robbed everyone of a good night’s sleep. The water was still running swift on Sunday, but the canoeists broke camp nd headed downstream. 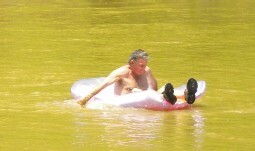 They retrieved river booty consisting of two floats which the ladies used to cool off once camp was set up for the night. Th e river was rising fast. At first break the the paddlers decided they had had enough of the Buffalo and decided to get off and continue on the Jack’s Fork. A call was made to the outfitter to meet them at the next landing. Three hours later the group at Harvey’s, the Jack’s Fork outfitter, and the seven were paddling the Jack’s Fork by about 6:00 PM. It, too, was running high and fast due to the heavy rains. 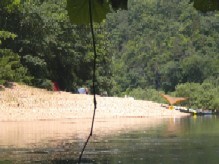 They found a good campsite across the river from Jam Up Cave. After a good supper they finally got a good night’s sleep. The campsite was so nice they decided to take a break from paddling. 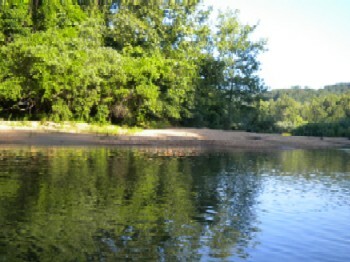 The group explored the cave across the river, hiked, and floated in the river. John could not believe that they had taken so much time off and Elmo remarked that it was the laziest canoe trip he had ever taken. Paddling began anew on Thursday. The Jack’s had changed from last year. There were downed trees, new chutes, and new gravel bars. Deadfall and debris high on the banks were grim reminders of how the river had been. Everyone except John had a close calls after being rushed into trees by the sift current. George and Carol m et with disaster when a bush in the center of a chute flipped their canoe. Art and Janice watched from nearby but could only wait until George and Carol floated the overturned canoe to gravel bar where it was unlaoded, emptied, and re-packed. There were many other similar areas of the river but they were navigated skillfully without incident. After one more night spent beside the river the group headed for take-out at Alley Springs. John says the Jack’s Fork must be the standard for beautiful, clear running water. There are no homes and there are few canoeists on the upper stretches of the river. It was true wilderness, and John plans more trips there.